The Way is basically perfect and all-pervading. How could it be contingent upon practice and realization? The Dharma-vehicle is free and untrammelled. What need is there for concentrated effort? Indeed, the whole body is far beyond the world’s dust. Who could believe in a means to brush it clean? It is never apart from one, right where one is. What is the use of going off here and there to practice? And yet, if there is the slightest discrepancy, the Way is as distant as heaven from earth. If the least like or dislike arises, the Mind is lost in confusion. Suppose one gains pride of understanding and inflates one’s own enlightenment, glimpsing the wisdom that runs through all things, attaining the Way and clarifying the Mind, raising an aspiration to climb the very sky. One is making the initial, partial excursions about the frontiers but is still somewhat deficient in the vital Way of total emancipation. Need I mention the Buddha, who was possessed of inborn knowledge? The influence of his six years of upright sitting is noticeable still. Or Bodhidharma’s transmission of the mind-seal? -the fame of his nine years of wall-sitting is celebrated to this day. Since this was the case with the saints of old, how can we today dispense with negotiation of the Way? You should therefore cease from practice based on intellectual understanding, pursuing words and following after speech, and learn the backward step that turns your light inwardly to illuminate your self. Body and mind of themselves will drop away, and your original face will be manifest. If you want to attain the Awakening, you should practice the Awakening without delay. 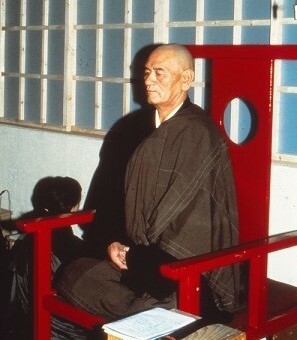 For zazen, a quiet room is suitable. Eat and drink moderately. Cast aside all involvements and cease all affairs. Do not think good or bad. Do not administer pros and cons. Cease all the movements of the conscious mind. Don’t judge thoughts and views. Have no designs on becoming a Buddha. Zazen has nothing whatever to do with sitting or lying down. At the site of your regular sitting, spread out thick matting and place a cushion above it. Sit either in the full-lotus or half-lotus position. In the full-lotus position, you first place your right foot on your left thigh and your left foot on your right thigh. You should have your robes and belt loosely bound and arranged in order. Then place your right hand on your left leg and your left palm (facing upwards) on your right palm, thumb-tips touching. Thus sit upright in correct bodily posture, neither inclining to the left nor to the right, neither leaning forward nor backward. Be sure your ears are on a plane with your shoulders and your nose in line with your navel. Place your tongue against the front roof of your mouth, with teeth and lips both shut. Your eyes should always remain open, and you should breathe gently through your nose. Once you have adjusted your posture, take a deep breath, inhale and exhale, rock your body right and left and settle into a steady, immobile sitting position. Think not-thinking. How do you think not-thinking? This in itself is the essential art of zazen. The zazen I speak of is not learning meditation. It is simply the Dharma gate of repose and bliss, the practice-realization of totally culminated enlightenment. Zazen is the manifestation of ultimate reality. Traps and snares can never reach it. Once its heart is grasped, you are like the dragon when he gains the water, like the tiger when she enters the mountain. For you must know that just there (in zazen) the right Dharma is manifesting itself and that, from the first, dullness and distraction must be struck aside. When you arise from sitting, move slowly and quietly, calmly and deliberately. Do not rise suddenly or abruptly. In surveying the past, we find that transcendence of both unenlightenment and enlightenment, and dying while either sitting or standing, have all depended entirely on the strength of zazen. In addition, the bringing about of enlightenment by the opportunity provided by a finger, a banner, a needle, or a mallet, and the effecting of realization with the aid of a flycatcher, a fist, a staff, or a shout, cannot be fully understood by discriminative thinking. Indeed, it cannot be fully known by the practicing or realizing of supernatural powers, either. It must be deportment beyond hearing and seeing – is it not a principle that is prior to knowledge and perceptions? This being the case, intelligence or lack of it does not matter: between the dull and the sharp-witted there is no distinction. If you concentrate your effort single-mindedly, that in itself is negotiating the Way. Practice-realization is naturally undefiled. Going forward (in practice) is a matter of everydayness. In general, this world, and other worlds as well, both in India and China, equally hold the Buddha-seal. And over all prevails the character of this school, which is simply devotion to sitting, total engagement in immobile sitting. Although it is said that there are as many minds as there are persons, still they all negotiate the way solely in zazen. Why leave behind the seat that exists in your home and go aimlessly off to the dusty realms of other lands? If you make one misstep, you go astray from the Way directly before you. You have gained the unique opportunity of human form. Do not use your time in vain. You are maintaining the essential working of the Buddha-Way. Who would take wasteful delight in the spark from the Flintstone? Besides, form and substance are like the dew on the grass, destiny like the dart of lightning–emptied in an instant, vanished in a flash. Please, honoured followers of Zen, long accustomed to groping for the elephant, do not fear the true dragon. Devote your energies to a way that directly indicates the absolute. Revere the person of complete attainment who is beyond all human agency. Gain accord with the enlightenment of the Buddhas; succeed to the legitimate lineage of the ancestors’ samadhi. Constantly perform in such a manner and you are assured of being a person such as them. Your treasure-store will open of itself, and you will use it at will.